The choices you make for your kitchen are important, and you have to be able to live with them. 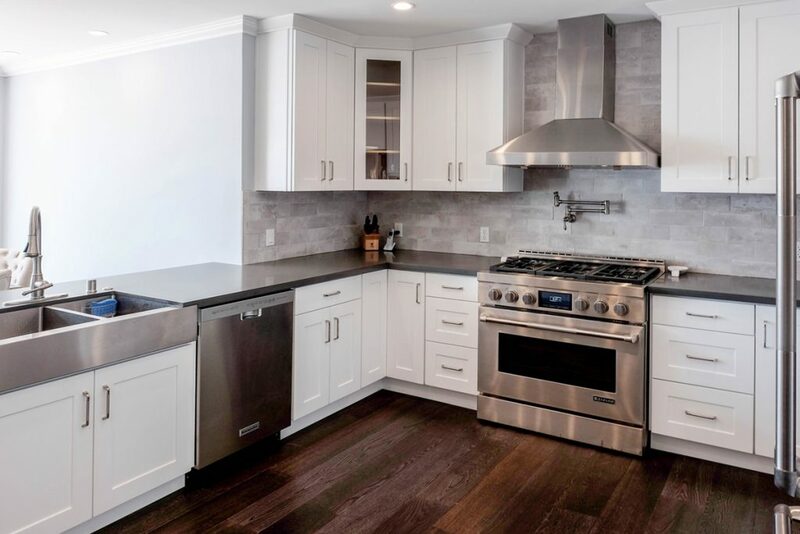 They will not only establish the style that will be prevalent for all to see, they will determine how efficiently the kitchen functions as well. 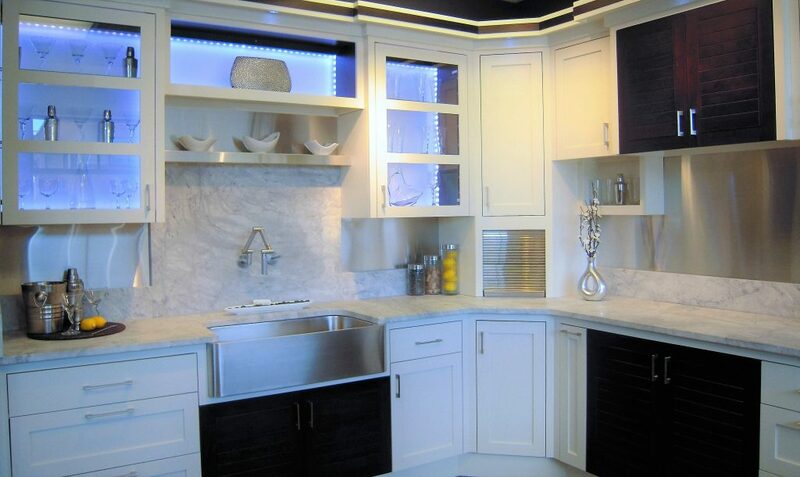 In this in-depth directory, we take a detailed look at all of the types and styles of kitchen cabinets that are available. Most of what you need to know is right here (and anything else is surely within the pages of this site!). 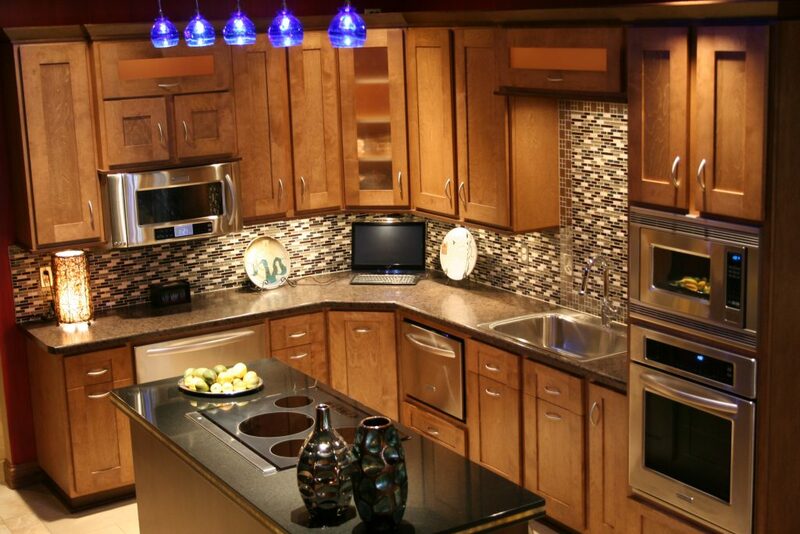 The two primary factors considered when choosing cabinet doors are style and budget. 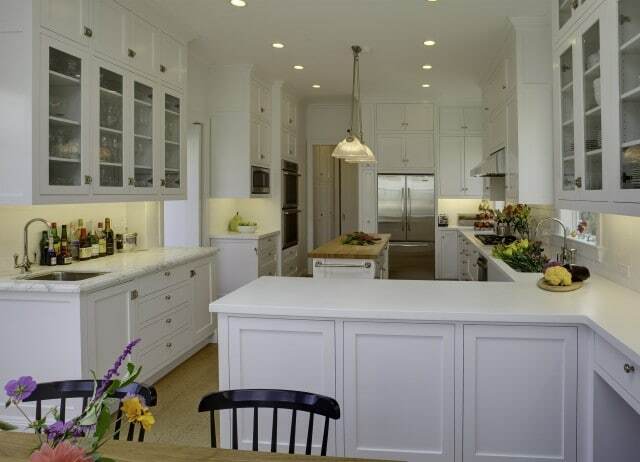 Certainly, cabinets are among the most visible design elements in the kitchen and they can be rather expensive. From basic to elegant, however, there is a style to fit every need. Easily the most common cabinet door in use today, the shaker is part of a larger family of related furniture design known for its utility-friendly simplicity. It is a style that lends itself to nearly any established décor, fitting in well with everything from contemporary to traditional settings. Shakers may be constructed from a variety of wood types, and finished with any number of stains or paints (the ‘natural’ finish being most cost-friendly). They are comprised of five pieces, a four-piece frame attached to a single center panel. For cost efficiency, the center panel may be replaced with less expensive material. Among the more expensive door styles is the ventilated Louvered design. 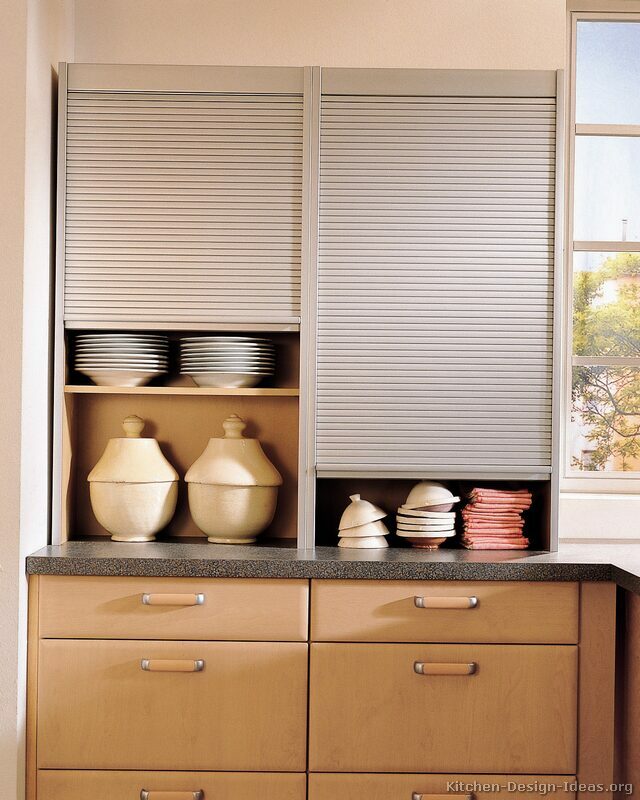 Much like you would find in wooden window blinds, it is comprised of horizontal wood slats. Most examples are built with thin open spaces between each long panel that are barely visible (although cheaper closed versions are made as well). The subsequent air flow makes them ideal when ventilation is required, although they are generally chosen for their visual aesthetic. 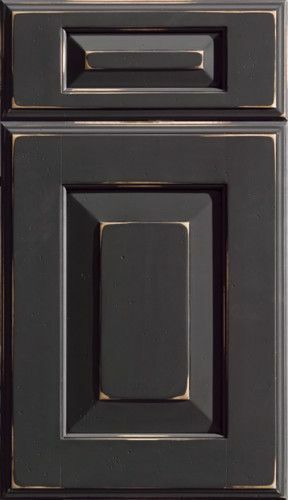 Void of decorative flair, the simplicity of a flat panel cabinet door is in fact the basis for its style. It is versatile in its modest design, appropriate for both modern and contemporary motifs. It is generally made of wood, but when budget is a priority, a laminate construction is preferred. Of further advantage, laminates are available in a variety of colors and patina. 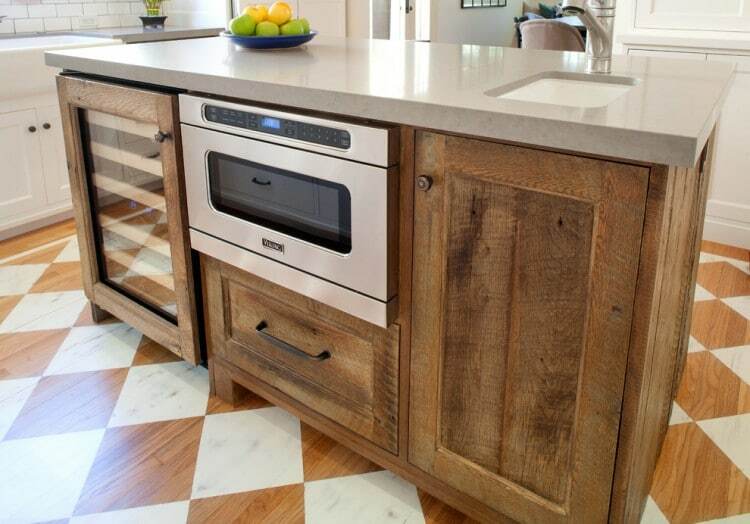 Certainly one of the more popular ideas to emerge in recent years is that of the distressed-style cabinet doors. The vintage appeal has never been more fashionable, and that’s exactly what distressed doors emulate – an antique appearance. For an additional ‘relic’ feel you may even opt to have the corners sanded down to emulate age-old wear. This technique may be applied to most door styles. For those who adore the homey feeling of cottages, the beadboard door style is ideal. Before the days of drywall and plaster, it was beadboard most commonly used for wall embellishment. 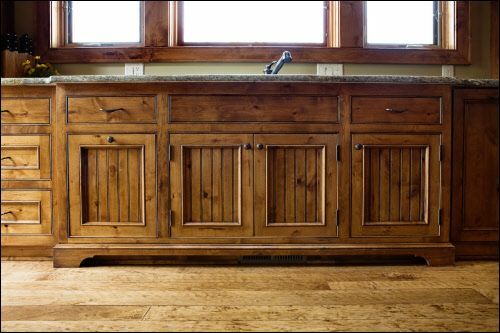 The center panel of a beadboard cabinet emulates the classic paneling design associated with the vintage rustic flavor of cottages. When low cost is the priority, thermofoil doors are at the top of the list. They are actually molded, made from a material called “medium-density fiberboard” (or MDF), that is covered in a type of laminate and heat treated to make it solid. They are quite durable, though any damage they potentially incur is generally irreparable.Though mass produced, they are limited in selection – solid colors or imitation wood grain only. When budget is not a concern, but the standard styles are found generally unappealing, you may always design your own cabinet. If you have a vision, there is a professional creative collaborator out there who wants to help you realize it. Simply seek out cabinet makers or designers in your area. Those who prefer the ultra-modern influence may choose to forgo wooden cabinet doors completely. Glass allows cabinets contents to be on display while they are stored, and it opens the area to space and light. 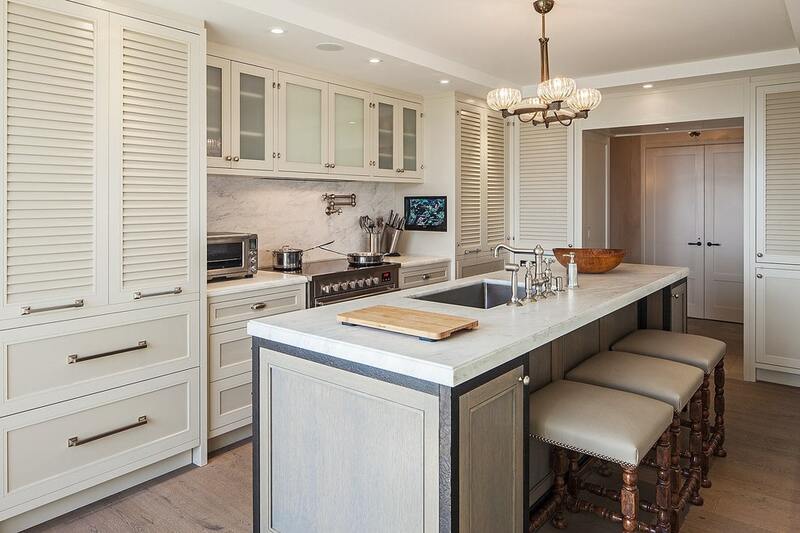 Connected to the main body of the kitchen on one side, a peninsula is accessible on three sides and serves to separate the kitchen from what other room is adjacent. Not long after its introduction there was a popular feeling that the design created a minor claustrophobic effect by nearly closing off the kitchen. 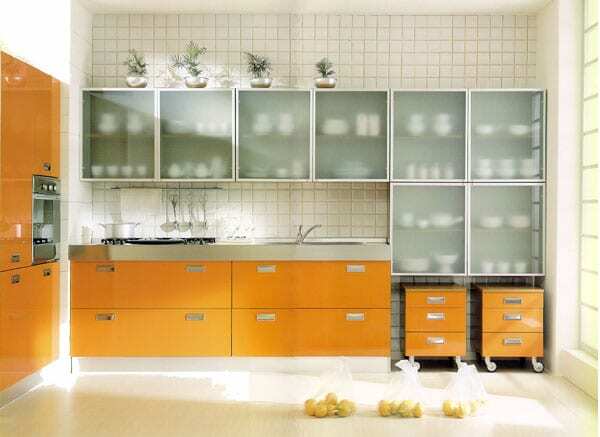 Thus, the idea of adding glass front cabinets was born. It’s a beautiful concept that creates an open well-lit atmosphere. 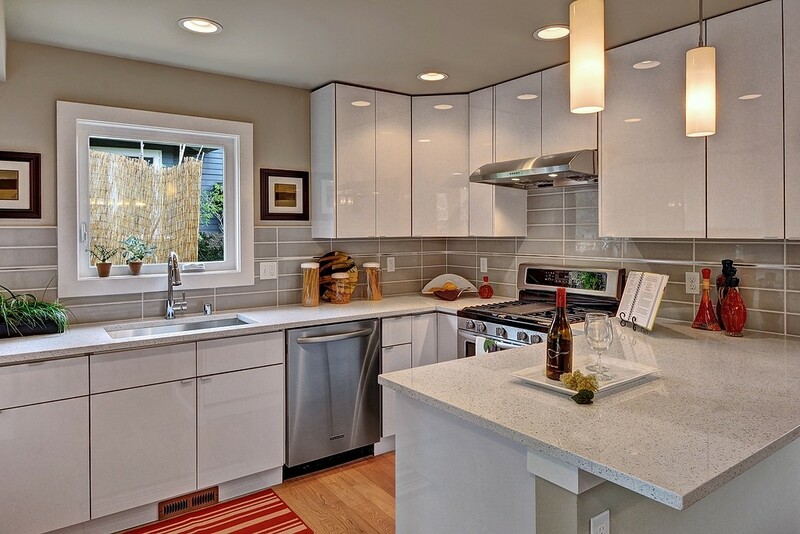 It’s a sleek contemporary look provided by frameless glass cabinet doors. 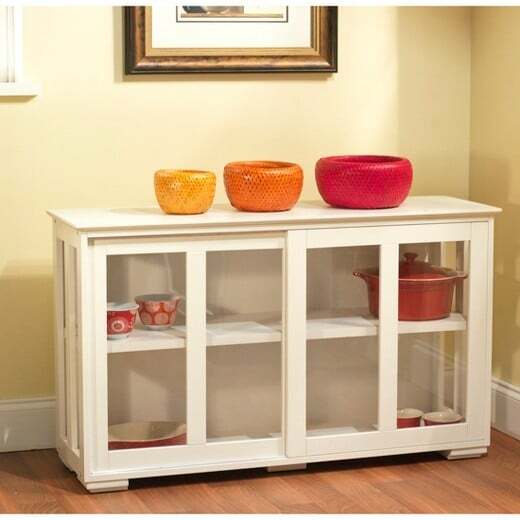 Typically, and in fact traditionally, a cabinet with a glass front is framed by wood. But these feature single sheets of glass, unframed, and they make up the entire cabinet front. In lieu of hardware these doors feature decorative hinges. A truly unique design that you don’t commonly see is used when a kitchen has more windows than wall space. With no room for cabinets an ingenious and entirely modern solution was surmised – installing wall cabinets directly on top of the windows. To maintain the daytime illumination by sunlight, picture window cabinets with no back panel are used. Light refraction has never been so stunning. The 70’s phenomenon is just as popular as ever. 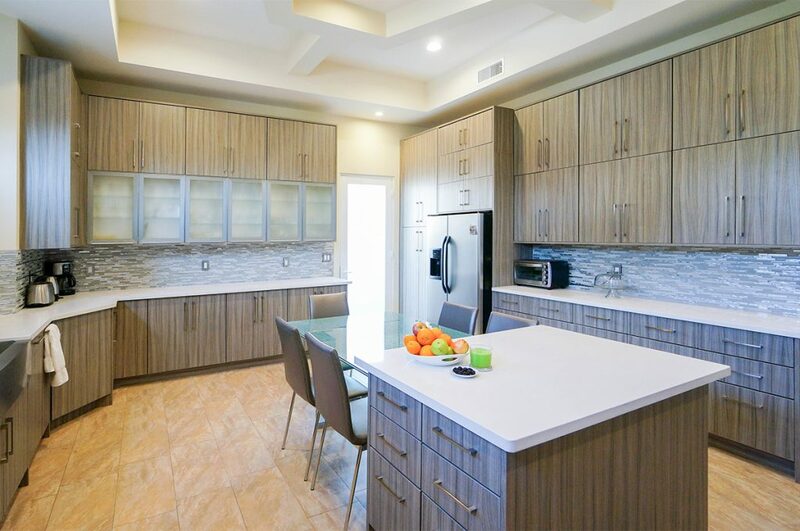 After a resurgence of interest in the design, homeowners are once again adding the sliding glass cabinet doors to their kitchens. 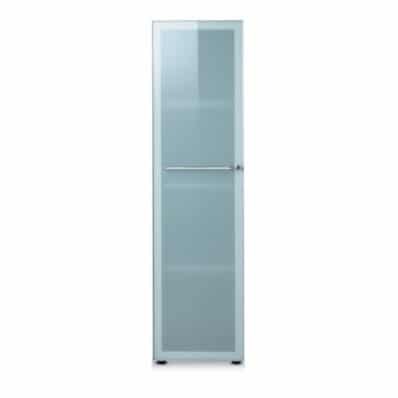 A recessed track installed on the top and bottom of the long cabinet allows sheets of glass to open and close freely. Sometimes hardware is drilled directly into the glass, other times a simple finger pull is cut out to allow easy control. 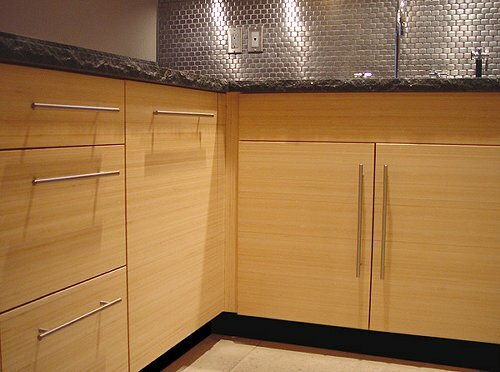 Just like their wood counterparts, cabinet glass fronts come in a large variety of patterns and finishes that may be used with framed or frameless cabinet doors. Seeded glass, for instance, features fixed tiny air bubbles that create an appearance of texture. 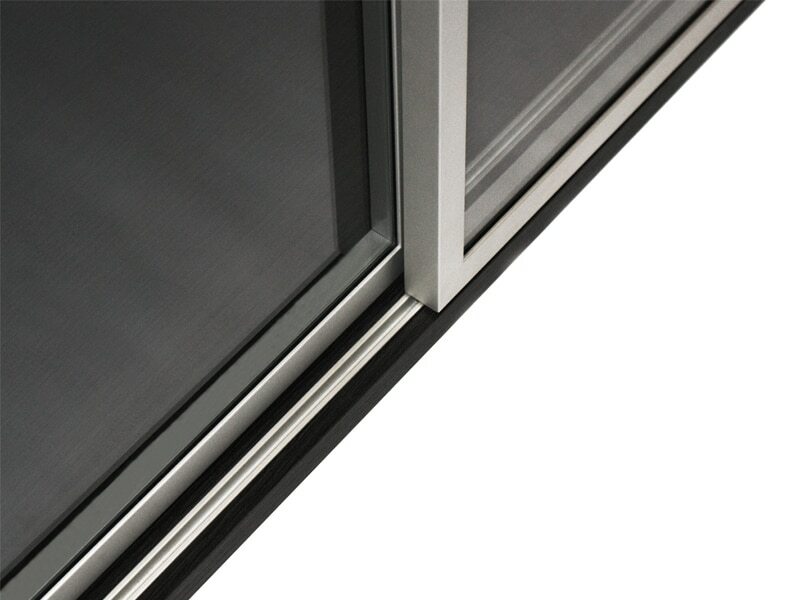 Often, you can get a glassless door frame that is set up for easy installation. This affords you the opportunity to shop around. Among the exciting glass options available are colored, stained, frosted and etched. 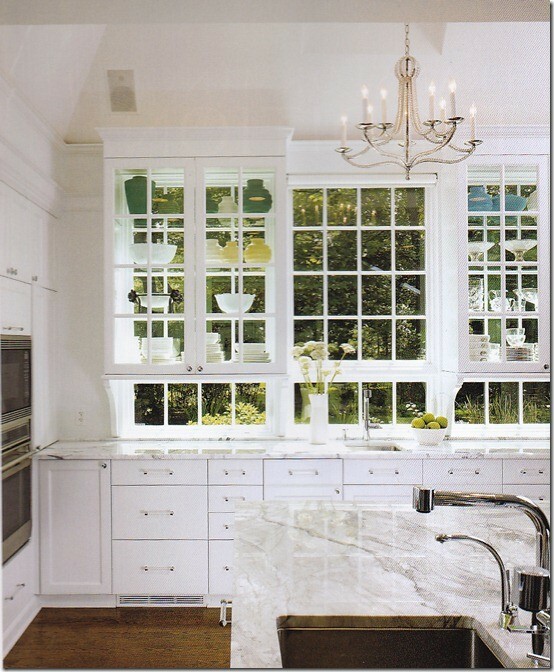 The upper cabinetry of many kitchens is typically the extent of where glass is found. But it can be used with the cabinets below as well. A prevalent concern however is having them under countertops at where people sit. But if you have a relatively inactive and safe counter area the glass approach is really quite appealing and delivers a consistent, almost futuristic look. 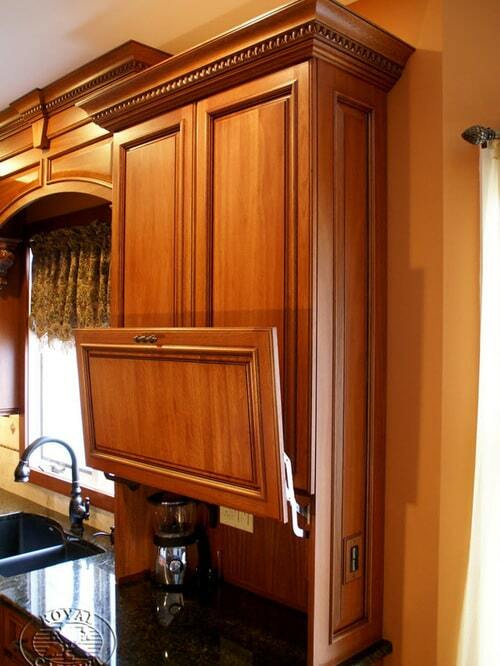 Tall cabinets are used to house large wares such as brooms mops, the vacuum cleaner and other related items. 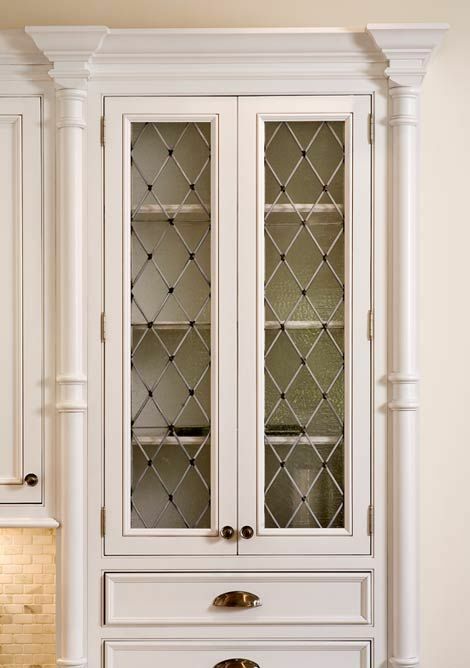 With a glass door these cabinets can create a sleek aesthetic, especially when placed within a matching motif that has already been established for the kitchen. One side of frameless glass panes are painted to create a dazzling glossy shine called a “factory finish”. It’s achieved with heavy duty epoxy paint that is applied evenly to what will be the back of the glass. The process is performed in a controlled environment that prevents any imperfections. The payoff is a flawless brilliant outer appearance. The cabinet door that swings from two hinges on one side is hardly the extent of what you can work with. You can improve functionality and have fun with style by implementing any one of a number of cool options that are extremely efficient in a variety of ways. 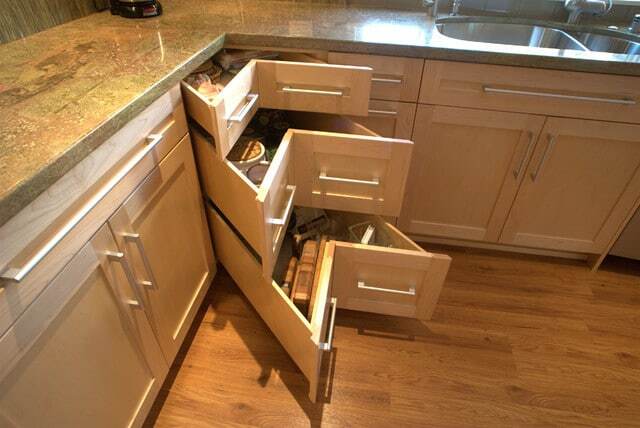 Instead of enduring the potential clumsiness caused by the opening and closing of two cabinets on opposite sides of the same corner, imagine if you could just pull the corner out. 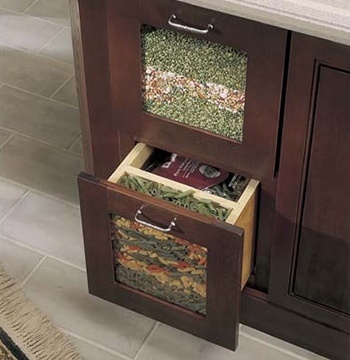 L or V shaped cabinet doors open to expose a ton of open storage space. Despite the appealing innovation, these are not widely available and locating them may require some searching. An approach that was once unheard of is to lose all of the doors that swing open and replace them with track doors. They slide side to side revealing the cabinets interior, one half at a time. 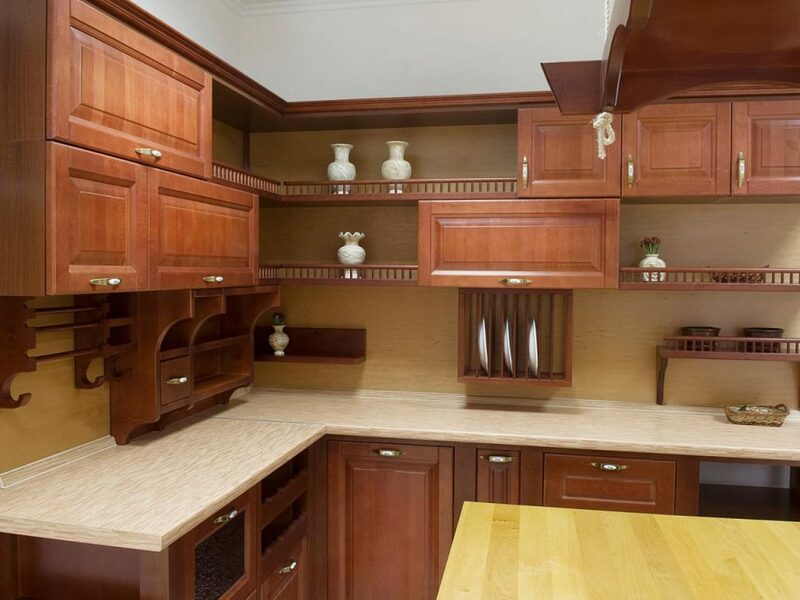 A minor drawback may emerge because it is impossible to have all cabinets open simultaneously. But how often is such an action needed? You may even seek an oil-rubbed-bronze finish for the ball-bearing track – it has a tastefully industrial appearance. Even more appropriate than when used for full sized doorways, pocket doors are excellent for concealing oft-used task and prep areas in the kitchen. 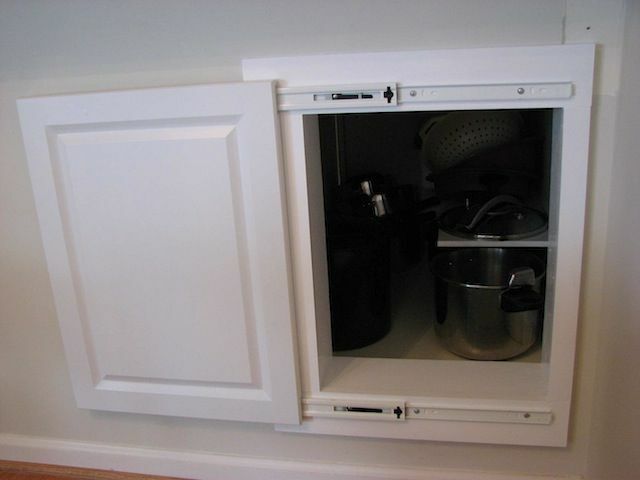 By installing a small pocket of only 3 inches onto each side, you may actually open the doors just like any other cabinet. The feature that makes them unique, however, is that you may then slide them into the cabinet, where they are completely out of the way. Also known as “parallel lift-up doors”, flip up doors use a hydraulic mechanism to aid in raising the door open, as opposed to the traditional manual sideways motion. They are perfect for areas and situations where the door is best found completely out of the way. 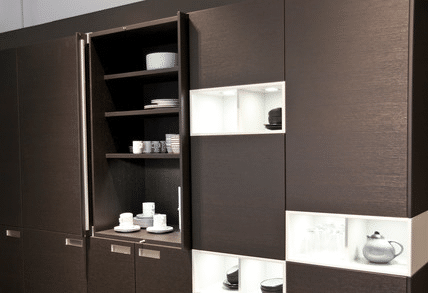 Deceptive cabinet doors that appear to lift out with the aid of the attached horizontal handles conceal their true function, sliding out from center, apart and flat. Strategically placed special hinges allow for perfect camouflage of its sly design and the contents within. Everyone’s familiar with how tambour doors function thanks to the similar action of garage doors. Instead of protecting cars, these typically cover much smaller appliances such as a toaster, blender or coffee maker. It’s the construction of thin wooden horizontal strips backed by fabric that allow for the collapsing semi-circular opening and closing motion. 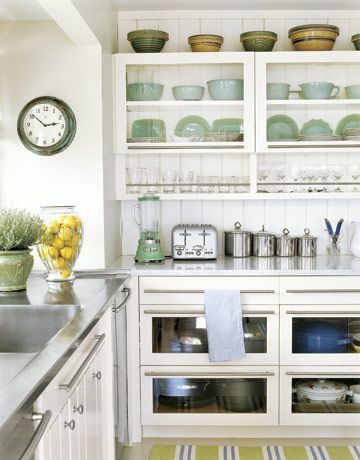 Besides providing the illusion of a larger kitchen glass front drawers also contribute to better organization. 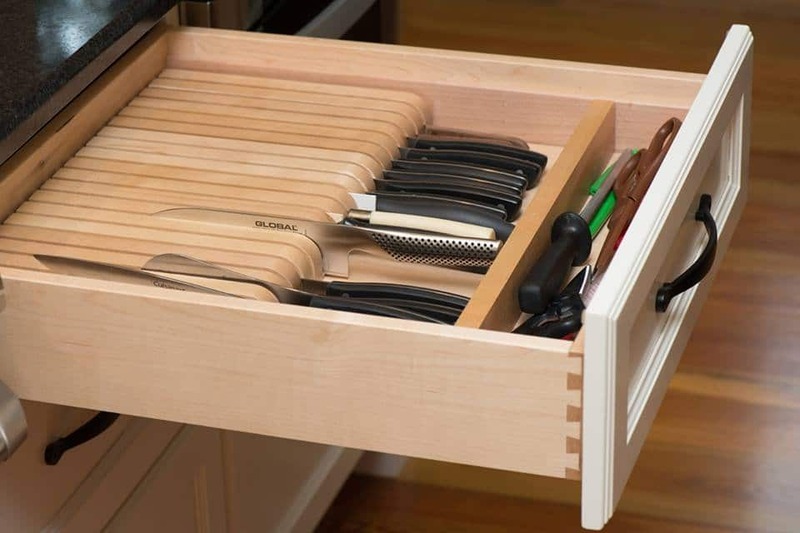 Often the drawers feature a two to three inch compartment at front dedicated to housing dry goods such as pasta or hard candy at capacity – it is an intentional design device. Anything goes – you may even use old-fashioned crates as drawers. Sometimes you just want to think out of the box and be a little wacky. If your DIY is in need of some interior hardware, first simply try applying some beeswax for easy open and shutting. Among today’s top concerns is the welfare of our environment. 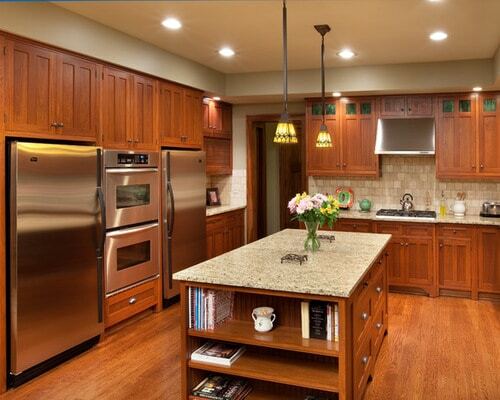 The world of cabinetry does its part by offering “Green” alternatives that aid with making our world a healthier place. You can improve your home’s air quality as well as reduce toxin exposure with eco-friendly cabinets. 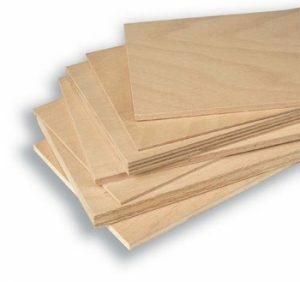 Common materials used for making cabinets such as particleboard, fiberboard, plywood are typically made with urea formaldehyde glues which release fumes. And since formaldehyde is a known carcinogen, its emissions are regulated by the government. That’s why FSC certified plywood, bamboo plywood and agri-fiber boards use agricultural byproducts that are an annually renewable resource. VOC’s (Volatile Organic Compounds) are chemical fumes. 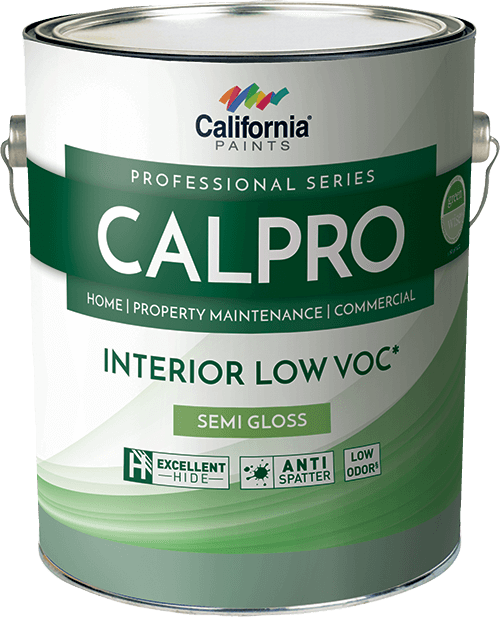 You may help improve indoor air quality by selecting finishes labeled NO-VOC or LOW-VOC. Water-based finishes are also recommended because they contain a naturally low number of harmful VOC’s. Seek out wood certified by the Forest Stewardship Council and you will be making a good sustainable earth friendly wood choice. 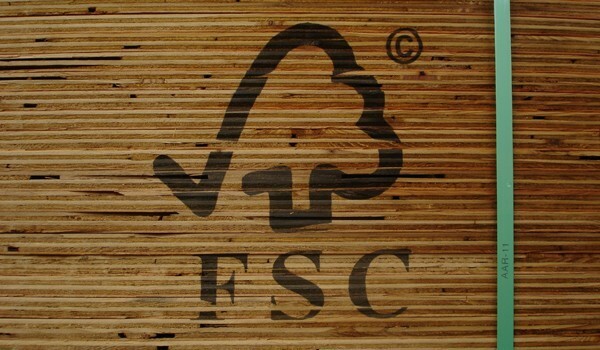 You are ensured that the wood you buy comes from responsibly harvested forests. If you want sustainable options look no further. Salvaged wood is for you – why cut another tree down? There’s no need to be wasteful. Where will your salvaged wood come from? It has a personality all its own and may even be a fun topic of conversation for its admirers. 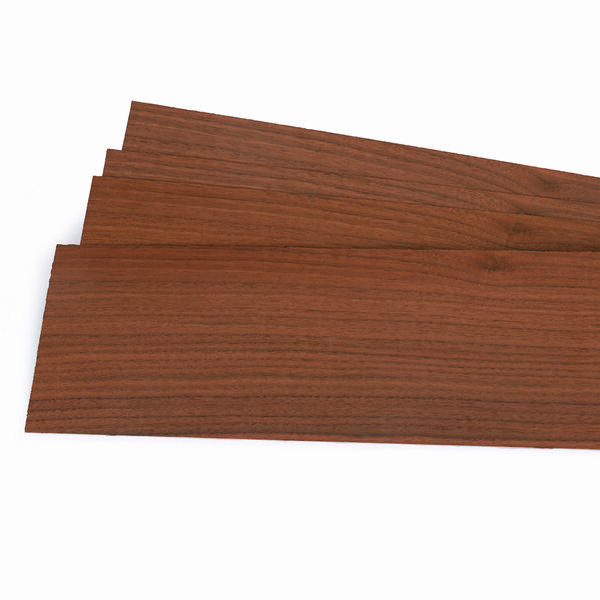 A thin slice of wood adhered to a substrate successfully imitates the look and feel of wood. You don’t need fresh hardwood cut for a cabinet, that’s just excessive in this age where there are tons of wood waiting to be recycled. Bamboo is becoming a popular renewable source of wood as well. Since it is naturally stronger than most hardwoods and it features a truly unique and popular grain pattern, bamboo is the choice for many green conscious homeowners. Grown on Brazilian plantations, Lyptus is a somewhat new product engineered from a hybrid species. It has the same traits as common hardwoods but matures at a quarter of the time – about 15 years. It is beautiful and ecological.